This Asian-inspired side dish is orangey...VERY orangey. Screamingly orangey. But it's delicious. 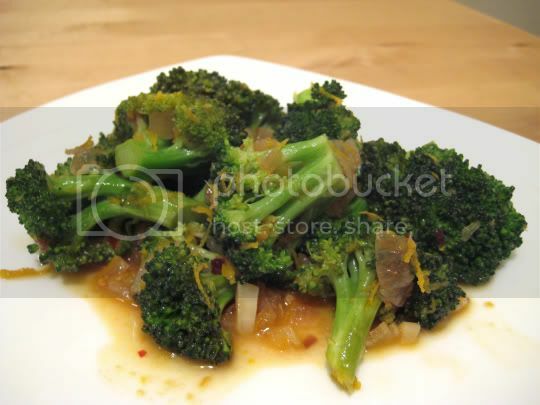 Not only is the broccoli cooked in a sauce of orange juice, a little balsamic vinegar, and shallots and garlic, but TWO oranges worth of zest is also included, and this is where the pungent orange flavor comes from. The zest contains a large amount of the skin's oil, and boy is this stuff powerful. A little bit of red pepper flakes adds just the right amount of heat, a little balsamic adds some tanginess, and the sesame oil adds the real Asian flavor. Just one suggestion: steam the broccoli before cooking it in the sauce, as 5 minutes isn't quite enough to get the broccoli to a nice cripsy tender texture. This would go wonderfully with veggie fried rice and a spicy tofu dish, or even just with plain steamed white rice. Make again? Yes, to complement an Asian main dish.